There is great barbecue everywhere. So I decided to bring some Asian tastes into some rub and sauce by combining them with classic barbecue flavours. Welcome to East West Chicken Thighs. 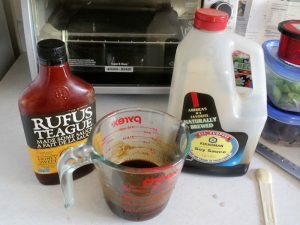 I made a simple sauce first by mixing 75 ml (1/3 cup) soy sauce, 75 ml (1/3 cup) barbecue sauce and 3 ml (1/2 tsp) curry powder. I set it aside for the flavours to marry. I injected 12 thighs with 50 ml (1/4 cup) Cajun Injector Creole Butter. This is optional but does add a bit of flavour kick. I rubbed the chicken down with the mixture. I preheated my smoker to 350 F. If you don’t have a smoker, you can cook these in a 375 F oven. I put the chicken on and cooked for 15 minutes. I flipped the chicken and cooked for 15 minutes more. I brushed with the sauce. I cooked for 20 minutes more until the thighs were a nice colour. It may take a bit longer in some smokers and depending on the size of the thighs. Mine were quite small. 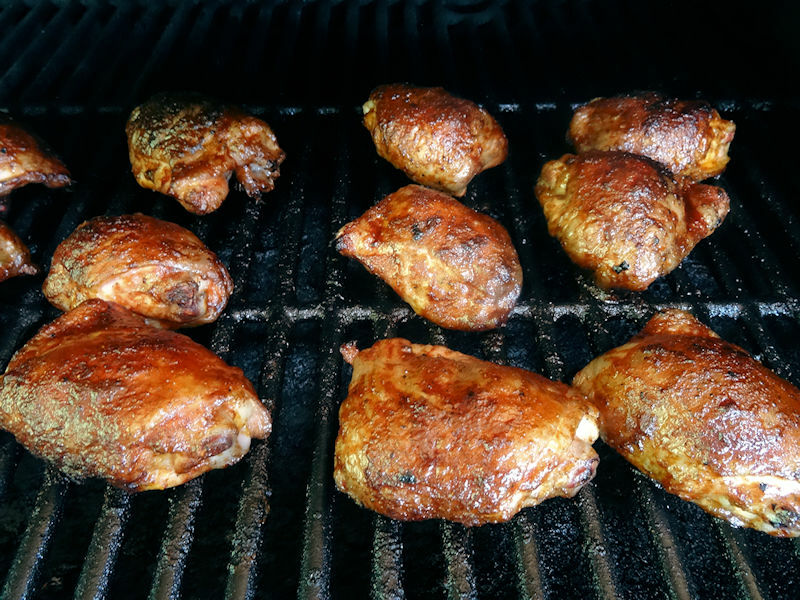 I made sure the internal temperature of the thighs were over 165 F.
I let them sit for 5 minutes and served. These are great. The soy sauce gives them a nice salty touch and with the curry gives it a nice earthy flavour. Inject the thighs with Creole Butter if using. Mix the rub ingredients together and rub over the surface of the thighs. 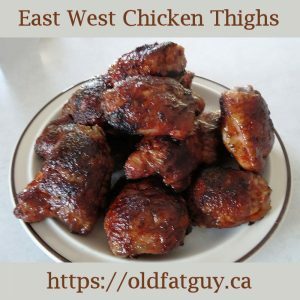 Preheat a smoker to 350 F or an oven to 375 F.
Cook the thighs for 15 minutes. Flip and cook for 15 minutes more. Brush the sauce over the thighs and cook for 20 to 30 minutes, until the thighs are a nice colour. Make sure the internal temperature of the thighs are over 165 F.
I’ve never heard of using an injector before. I had to look it up. How cool! Your wings look absolutely delicious. Injectors are easy if messy to use and do allow you to add an extra layer of flavour! Thanks for the kind words. I’m an old, not-too-fat, gal and I’m in the middle of making your delicious-looking chicken thighs. The sauce tastes delicious!! I know the family will love it. Thanks for the recipe, will be looking for more recipes of yours. Thanks, Laverne! You are very kind!